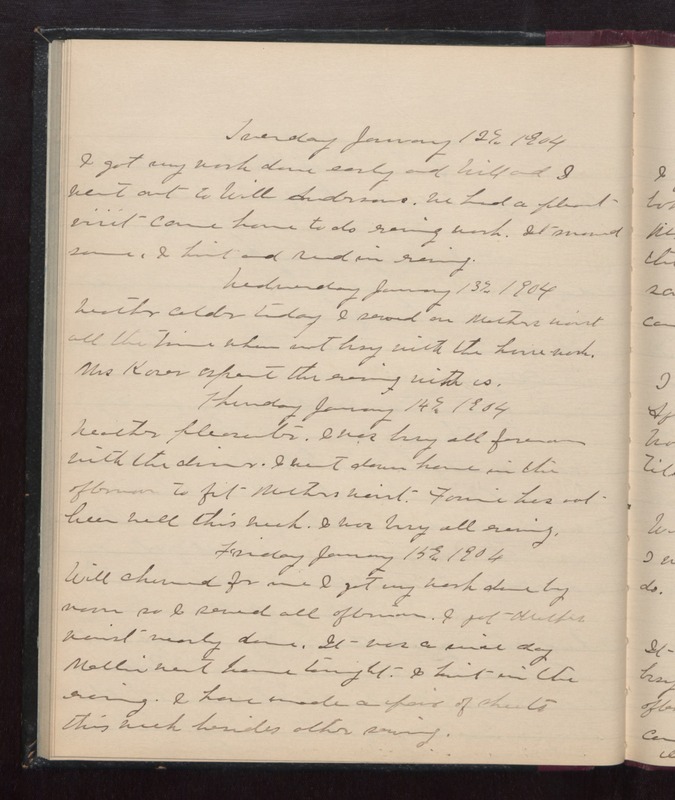 Tuesday January 12th 1904 I got my work done early and Will and I went out to Will Andersons. We had a pleasant visit came home to do evening work. It snowed some. I knit and read in evening. Wednesday January 13th 1904 weather colder today. I sewed on Mother's waist all the time when not busy with the house work. Mrs Koser spent the evening with us. Thursday January 14th 1904 weather pleasanter. I was busy all forenoon with the dinner. I went down home in the afternoon to fit Mothers waist. Fannie has not been well this week. I was busy all evening. Friday January 15th 1904 Will churned for me I got my work done by noon so I sewed all afternoon. I got Mothers waist nearly done. It was a nice day. Mollie went home tonight. I knit in the evening. I have made a pair of sheets this week besides other sewing.